From the Hancock County Courthouse, take Hwy 22 southwest for 7.2 miles to Devereux. Turn right (at the backwards fork) onto Main Street. Go 0.2 mile to the dead end and turn left onto Jones Chapel / Devereux Rd. Go approximately 4.5 miles. You will see the Walls Cemetery on the right. Just past Walls Cemetery is a woods road which goes behind Walls Cemetery. Take this road for 0.2 mile to a gate. Walk 0.1 mile further to the cemetery. Alternately, from the corner of Jones Chapel and Carrs Station Road, drive 0.4 mile on Jones Chapel Rd to the driveway to the cemetery on the left (see above directions). Possible grave marked by a stone. No graves visible but room for 8-10 graves. 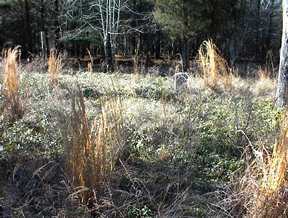 One unmarked grave at the end of the area. w/o Joseph F. Layfield. "At rest"
"Blessed are the pure in heart for they shall see God." 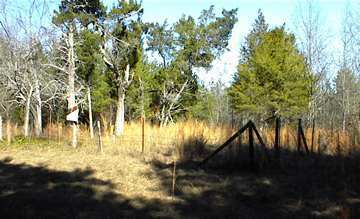 Space for 6-8 graves, with an additional 2 graves definite. Space for two graves but no graves visible. Definitely 5 unmarked graves, with more possible in this, the third row. No graves visible but space for at least 5 graves in this, the 4th row. Aged 27 yrs, 7 mos, 28 days. No graves visible but space for 8-10 graves.